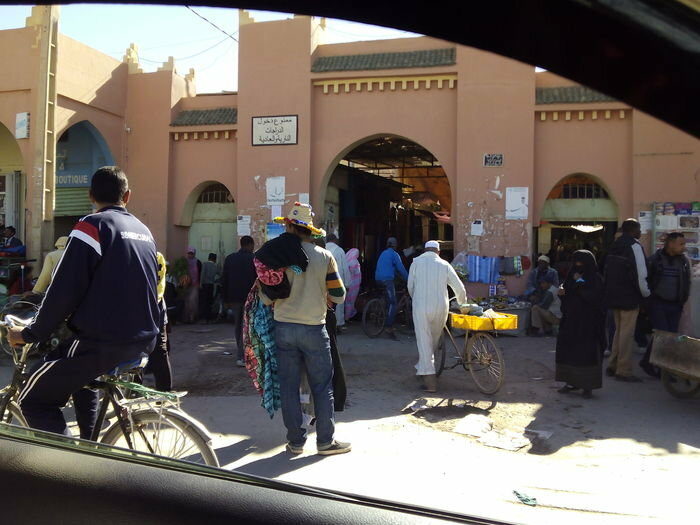 Marrakech – Ouarzazate – Zagora. Breakfast and departure across the impressive port of Tizi-In-Tichka, 2,260 metres of altitude. These mountains of the mountain range of the Atlas House, in their small villages of adobe, the life of its Berber inhabitants with all its hardness. 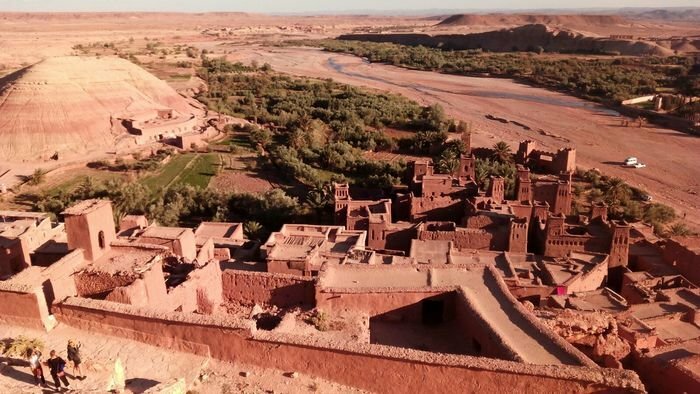 Before reaching Ouarzazate, we turn along a track to visit the famous Kasbah of Aït Ben Haddou, who has been declared Cultural patrimony of the humanity by UNESCO and which is without doubt the fortified village (Ksour) better preserved. Passing through the city of Ouarzazate, located atop a large plateau, we enter the so-called route of the thousand Kasbah. We continue the Draa Valley, of almost 200 kilometers long, which preserved all its authenticity. The palm groves and cultivated fields, there are interrupted by the presence of Kasbahs and Ksours of adobe; These sheltered from its walls, are home for people of very original architecture. Average afternoon arrive at Zagora, “The door of the desert”. The famous poster “Tombouctou 52 days camel”, is located in this village at the end of the main street, where most of the shops are. Dinner and accommodation at hotel. Zagora – Tazzarine – Alnif – Dunes of Merzouga. After breakfast, we will start the route to Tazzarine. A track just before the population, there is a spectacular Gorge and a small Palm Grove. Last Tazzarine becomes the Pueblo-Oasis of Alnif, in the middle basin of the Maader, one of the richest in fossils from Morocco. In the afternoon we drive to the Merzouga Dune Sea (Erg Chebbi), where up to 150 meters high dunes can be found. We will contemplate one of the best shows that offers us the desert, a sunset among the dunes. Dinner and overnight in tent or Kasbah. Merzouga – Rissani – Merzouga. After breakfast, visit to the town of Rissani. This town is attractive both by its environment and its history. It is regarded as the heir of the legendary Sijilmassa, ancient Tafilalet capital. This splendid city have just arrived in our days traces near the Oued Ziz. Rissani is first and foremost a Holy City, legend has it that in the 12th century there was a tremendous drought that ravaged the Tafilalet and local chiefs called for a descendant of Muhammad, Hassan the Alaoui, who came from Arabia to see if its beneficial influence attracted the rain, and so it was. After the visit, return to the hostel. 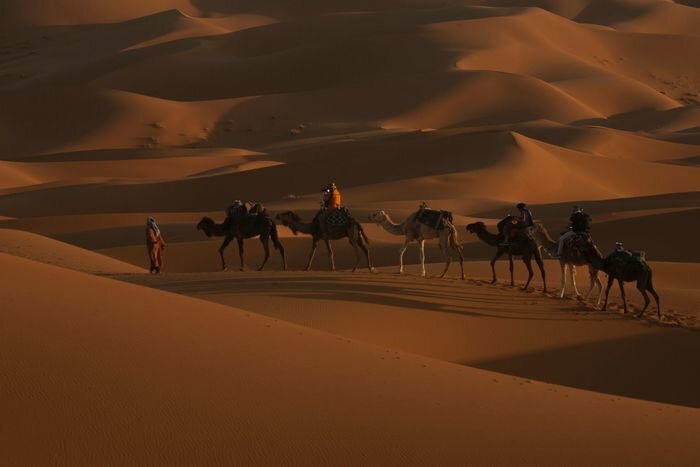 In the evening we’ll hike which leads inland from the sea of sand, making travel on the back of a camel, and that allows you to spend the night in a tent between the dunes. Merzouga – Todra gorges – Kelaa M’Gouna. Breakfast and departure towards the Tinerhir Palm. Arrival and visit among the palm groves of the fortresses (Kasbahs) and its gardens. Tinerhir is nestled between the Tafilalet and Draa. 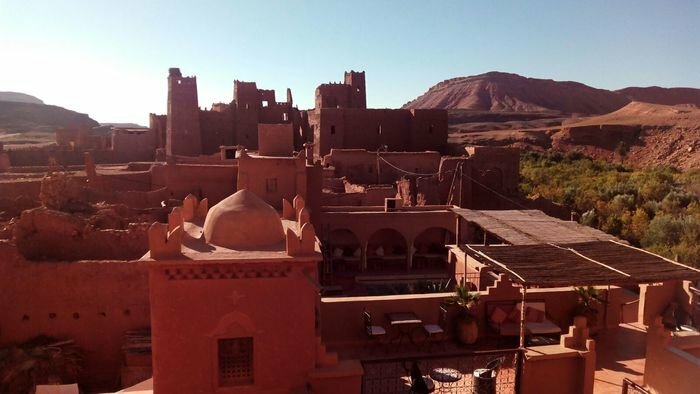 It is built on terraces, crowned by the ancient Kasbah of the Glaoui and surrounded by a hill on the important Oasis of the Todgha in which in addition to a lush Palm Grove, there are abundant olive, Orange and other fruit trees. 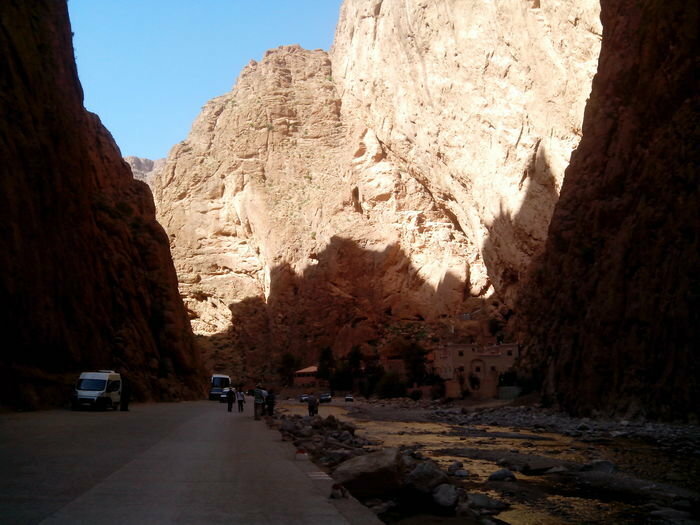 Only 15 kilometres from the town, at the end of a dense Valley with a stunning Palm Grove, and Berber villages, opens the magnificent Gorge of Todra, curious natural phenomenon where rises impressive gorges that manage to reach the 300 meters of height. We will continue to the Valley of Dades. The trip up there is nice and allows you to see almond and fig trees, fabulous rock formations and impressive Kasbahs and Ksars. We will continue to Kelaa M’Gouna, in the Valley of the roses. 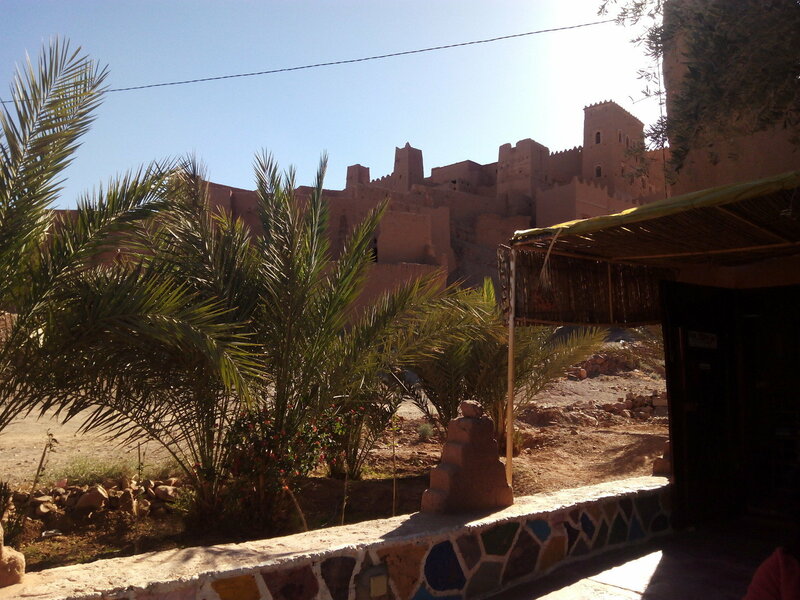 Dinner and accommodation in Kasbah. Kelaa M’Gouna – Ouarzazate – Marrakech. Breakfast and departure towards Ouarzazate. We will visit the famous Kasbah de Ameridil, one of the most beautiful Kasbahs, located in the Palmeraie of Skoura. We continue towards Marrakech, crossing again the port of Tizi-In-Tichka, 2,300 metres of altitude. Pick up at the airport and transfer to your contracted Riad/Hotel, also transfer to the airport at the end of the circuit. 4 x 4 vehicle around the circuit, driver and local guide. Accommodation Riad, Kasbah, tents, depending on location. Half board, breakfast and dinner (lunch and drinks not includes). Camel excursion for delving into the dunes. Excursions mentioned in the circuit. * Flights to Marrakech by the customer. Leila & Tuareg Tours, SL.